The migration of our blog posts to the new web host has taken much, much longer than anticipated but are now complete. We remain pleased that folks are still visiting the site, and interested in our experiences. It is our sincere hope that what we documented over the last 13 months of Jacks life can be of some solace to others who are experiencing the same, or similar situations. It's been a long while since our last post, and so much as happened! We are happy to report that our sponsorship dog in New York, Star, was adopted to a loving home who appreciates older dogs. Congratulations Star! We wish you a long and happy life. The Vet Aide Club at UC Davis, where Jack had some of his chemo treatments, sponsored a memorial brick for Jack at the Vet School. 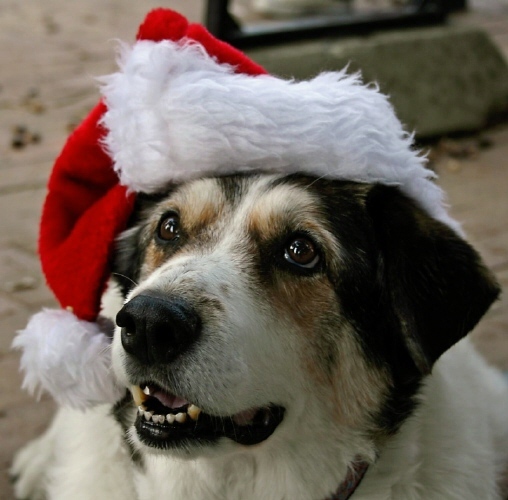 This is the same group of pre-vet college students who took Jack's picture in the Santa hat in December 2009, and put him in their fund-raiser calendar for December 2010. It was bittersweet to see his photo when we turned the page for December, only two weeks after he passed away. How happy he looked! We have no doubt he was proud to see his picture in the calendar. When the Vet Aide Club learned of his passing, they wanted to get him a memorial brick. We have a photo and will post it here in the next day or so... please check back. We are incredibly grateful to the Club and students who were touched by Jack's story. And finally... drumroll, please... Jack sent us a new dog! One of the last things we asked of him before he left us was to help us find our next buddy, and Jenny's next best friend. To make a long story short, John ended up talking to a rescue coordinator for the Animal Friends Rescue Project (AFRP) in the Monterey Bay area of California back in April. She asked a lot of questions, looked over this website, and said she had a dog in mind for us who would be perfect. His name is Austin, he's around 2 years old, and is a sweet and sensitive Australian shepherd whose time was up at a local shelter. He had been a stray and no one came looking for him. Austin was in a foster home, so we ended up communicating with his foster mom, Coco. After a couple of meetings to make sure Jenny approved (and Coco approved of us), Austin came home on May 27! We expected Jenny to be a bit cool to the idea of a new roommate at first, but eventually warm up to him. To our surprise and delight, she seemed to love him right from the start! Those two visits before he came home seemed to do the trick. They are fast friends and perfect companions. Jenny said the name Austin suits him, so we kept it, but he needed a middle name. His name is now Austin Wallace. She, of course, is Jenny Talkeetna Rose. Jack was Jack Francis (kudos to St. Francis who helped us care for him). Before Austin came home, Linda asked John what Jack would think of this. John said "Are you kidding? Jack would be the first one down there to sign the adoption papers!" No doubt. Our only regret is that Jack is not here to be Austin's big brother. Jenny is teaching him well. Jenny is happy. Austin is happy. John and Linda are happy. Jack did just as we asked of him... he sent us our next buddy. Although Jack left us six weeks ago, he remains part of us. We still talk about him, talk TO him, and miss him very much. We knew he had a big impact on our lives, but didn't fully appreciate how big until he was gone. There is little doubt that he'll always be with us. Jack loved everyone. If he could have one wish, he'd probably wish for every dog to have a long and healthy life and a loving home like his. So in his honor and memory, we are sponsoring a very sweet puppy named Troy who just arrived at Glen Highland Farm Border collie rescue in New York (www.glenhighlandfarm.com). Troy is only 5 months old and suffering from mange... a condition his family was unable to treat, so he is now in rescue. Hopefully Troy will heal quickly and be adopted by a lucky family in the coming months. We are excited to sponsor this lovely little boy! We think Jack would be very pleased. Meanwhile, we took Jenny back to Monterey and Carmel (California) last weekend for a short winter vacation. We used to take the dogs there several times a year before Jack got sick, and always had a great time (see the tab for our Spring Vacation photos at left). Since Jack left us, Jenny has been going to Doggy Play Group (day care) a couple of times a week to make new friends and gain some confidence. After a few weeks of sadness, she's starting to find her way as "Top Dog" in the family. She really enjoyed our trip to the coast and especially running off-leash! Merry Christmas to you and the pets in your life! Jack has been gone for just over two weeks and we miss him every day. While Jack may have gone on ahead, his fame continues to grow. See, last year on one of our trips to Davis, the UC Davis Vet Aide Club was having a "Photos with Santa" event and Jack simply couldn't pass that up. One thing led to another and before we knew it, Jack was wearing a Santa hat and posing for pictures. A few days later we received an email asking for permission to use one of Jack's photos for December in their 2010 calendar. We agreed of course, because that's exactly the kind of thing Jack would do...but with all he was going through we suspected he wouldn't make it to see his picture hanging on the wall. Well, he almost made it - just missed it by two weeks, and that's sure a lot more than we had dreamed of a year ago. So, if you have one of the calendars - enjoy your photo of Jack... and if you think of it, lift a glass and drink a toast to all the great dogs young and old who bring so much love and joy into our lives.